Before you can even begin planning a funeral, you must first know where it will end. If it is to be a cremation, what will be done with the cremains? Will they be retained? If so you’ll need an urn or other suitable container. If they are to be scattered, you may need to check into local laws governing such things and may need a permit. If, on the other hand, ground burial or a mausoleum crypt is to be the final resting place, then that’s where you’ll want to start your research and your planning. 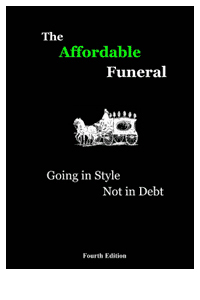 The Affordable Funeral goes into detail on the ins and outs of cemeteries, mausoleums, etc., but for our purposes here we’ll stick to the basics. In rural areas, cemeteries are rarely a problem. Communities have them, churches have them, and many families have their own. Likewise many Jewish communities have their own cemeteries, along with a committee which runs it. In our cities, however, cemetery space is getting rare . . . and expensive. Per a recent phone conversation with a cemetery owner in eastern New Jersey, there are less than 10,000 available burial plots left within a thirty mile radius of New York City, and you can bet they are going for a premium price since the NYC death rate is several times that annually. Reduced to its basic definition, a cemetery is “. . . land set aside for the interment of the dead.” Viewed from a purely capitalistic angle, however, a cemetery is real estate. Valuable real estate. Figure about three feet by seven feet per grave, toss in another foot around it for spacing, plus access roads and walkways and you’ll still come up with over a thousand graves per acre. Now multiply that by $750-$3,000 average sales price and you’ll see just how valuable that real estate really is. Oh, and add another $750-$1500 per site for the burial vault, $500-$1500 per site for opening and closing fees, and yet another $700-$2000 per site for monuments. Now do the math and you’ll come up with over $3 MILLION per acre! Whatever else it is, a cemetery is business . . . big business. If you go burial plot shopping well in advance of needing one, you can be more choosey and make your own deal. The cemetery sales staff, which are some of the most tenacious and aggessive sales people alive, will know this. You are shopping for a little plot of real estate at this point and can take it or leave it. If, however, you wait until you need a plot, you’ll be shopping for the answer to a pressing problem, and you can bet the staff will know this too. Prices for pre-need can be HALF what they’ll be once you’re ‘at-need’. Since the staff most places are paid by commissions-only, perhaps as much as 40-50% of the sales price, there is usually room to negotiate. This may not be true with the corporate-owned cemeteries, however, since most of their policies are set at the company headquarters and they have the resources to wait you out. Ask if they are corporate-owned before you even visit, and expect a bevy of tricky rules and restrictions if they are. A case in point is a new form Service Corporation International (SCI) has come up with to hold their cemeteries harmless in case of law suits for injuries suffered by families (via falls, etc)at their cemeteries. This form also puts the funeral home performing the service at-risk, perhaps in an attempt to make independently-owned funeral homes less likely to do business with SCI-owned cemeteries so the SCI-owned funeral homes (of which there are a few thousand in the USA) will get more trade. FYI, as this is written, SCI is involved in over 300 law suits nation wide, so perhaps they NEED this form more than most. Which brings us to the topic of CORPORATE-OWNED funeral establishments in general, and cemeteries in particular.